Was $129.99 Now $74.99 For A Limited Time Only! 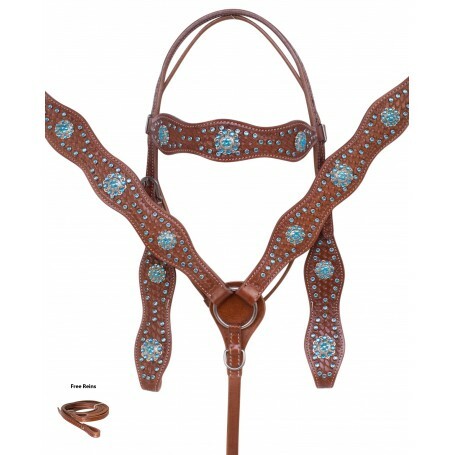 Get ready to be a rhinestone rider in this beautiful western tack set! This set features lovely shiny silver conchos, light blue crystal accents, dark chestnut oil leather, with a hand carved tooled design. The set also features turquoise blue rhinestone trimmings throughout that really make this set shine and stands apart from the rest! This set features stainless steel hardware with Chicago screw bit and rein attachments.